Sembia is a land of experienced merchants who know how to hold onto power and young traders who scheme for a share of it. Sembians relish the art of the deal, the skill of gaining advantage through negotiation instead of through outright falsehood or cheating. Although Sembia does not control as great a proportion of Faerûn's trade as Amn, trade controls Sembia much more than trade controls Amn. Unlike the lawless thugs of the Moonsea cities and the Pirate Isles, Sembians generally observe laws of contracts, debts, and interest payments. Quite often Sembians observe these laws all too well, exploiting loopholes that others had not imagined. Sembia conceives of itself as a young, aggressive, and expansionist nation. It has already co-opted one of the Dales, the former Moondale, and transformed it into a new capital fit for a great power: the City of Ordulin. But the Sembian elite are too interested in seeking advantage over each other to unite behind a single foreign policy or a single warlord. 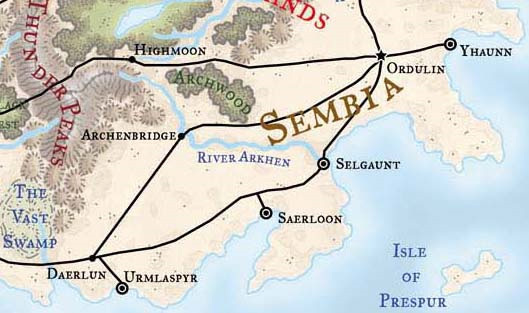 Sembia uses its position on the northwestern shore of the Sea of Fallen Stars to serve as the broker between the north and the south of Faerûn. The Zhents of the Moonsea also trade with other countries, but the Sembians don't consider them a true competition because a great deal of Zhent commerce flows through Sembian ports at one point or another, mostly through Ordulin. The Sembians do think of the Zhents as a magical threat, but the foremost worry of Sembia is the magical mercantilism of the Red Wizards Thay. The Council of Sembia has little interest in seeing Thay force its way into formerly Sembian markets by providing magical goods that the Sembians can't duplicate. Sembia is the land of wealth and the grasping drive to earn more. More vigorous and practical than ostentatious Amn, it's a place of costers and secret cabals, cults, and other dangerous dabblings of bored or the desperate. As long as other folk in Faerûn still have a few coins that could be in Sembian pockets or vaults, the folk Sembia are not content. Most Sembians spend their lives making money, doing business, having a hearty time in ways that display wealth (chiefly fashions, fads, and revels), and gossiping about Faerûn in general and their neighbors in particular. The cityfolk dominate Sembian life, and all citizens look down on the folk of other cities. Old money commands respect because of its extensive connections, and among the self-styled nobility of Sembia, all manner of corruption and incompetency is permitted as long as certain laws aren't breached (consorting with pirates, for instance, brings heavy fines and shunning). All but the greediest Sembian city guards are paid well enough to be above bribery. The guards are schooled in arms, dirty tricks, politeness, and understanding the ever-shifting intrigues. As a result, they're seldom heavy-handed and widely respected. Sembia has hot summers, rainy springs and falls, and bitter windy winters, when its harbors ice up for months. Sembian nobles own extensive farms and forested hunting estates, complete with large breeding stables and luxurious lodges, in the north and northwestern Sembian countryside. Sembia is a rich agricultural land of small farms in the center and north, turning to larger farms and orchards in the south. Vineyards cover the ridges, hedgerows leading into orchards and farms occupy all the lowland. The north and far west of the country are given over to livestock. Compared to farmers of other nations, who are often at a disadvantage when selling their products at market, Sembian farmers pride themselves on running efficient businesses and selling at the best possible prices. To the southwest, toward Cormyr, merchant families purchase huge tracts of land and practice the good life of the nobility. The self-styled nobility of Sembia maintain private armies, oversee vine yards and orchards, hunt, and pursue secret or individual passions ranging from mushroom cultivation to slave breeding. Officially, slaves are illegal in Sembia, but the nobles define legality on their own estates. The great families who maintained their wealth for generations have taken to styling themselves dukes and princes, and few choose to argue the point. Wherever ships can find good harbor, the rich cities of the southern coast cram hundreds of thousands of Sembians together in bustling hives of industry. When outsiders think of Sembia, they usually think of these southern ports instead of the rolling farmlands that occupy the center of the country. Each of the four great southern ts cities - Saerloon, Selgaunt, Urmlaspyr, and Thaunn - is "ruled" by a merchant prince who serves at the pleasure of the true powers of the city, the merchant councils. Daerlun (Metropolis, 72,477): Of all Sembian cities, Daerlun enjoys the closest relations with Cormyr. Centuries of intermarriage and close trading contacts with Cormyr have provided the citizens of Daerlun with a blend of Sembian business acumen and Cormyrian warmth and courtesy. Cormyrian traders who can't stomach interacting with other Sembians feel comfortable in Daerlun, a fact that the Daerlun traders are quick to exploit. Ordulin (Metropolis 36,330): The crossroads capital is the one area of Sembia in which politics are nearly as important as economics. Ordulin serves as the hub through which all other sections of the country interact. Ordulin is a new city, designed with care to proclaim Sembia's might and erase the memory of when this area was known as Moondale. The city is laid out like a great sunburst, with a central core consisting of three great buildings and mighty roads radiating out from the core like the rays of the sun. At the center are the Great Hall of the Council of Sembia (the voice of the merchant class and the nation's true rulers, at least until now), the Tower of the Guards, and the Guarded Gate, Sembia's mint and chief treasury. Rauthanvyr's Road: Sembia built its road through Cormanthor and remains determined to keep it open. Ironically, the departure of the Elven Court from Cormanthor has made Rauthauvyr's Road more dangerous rather than less. Attacks by opportunistic bandits, monsters, and drow have replaced the elven watchfulness. Kendrick Selkirk believes he can solve these problems by establishing friendly trading relations with the new drow communities in Cormanthor. The drow should be able to keep other intruders to a minimum, and although they're not the best partners, Sembia's relations with the "good" elves were never strong enough that dealing a with Vhaeraunian drow might not be an improvement. Saerloon (Metropolis, 74,496): Saerloon's soaring gothic architecture, peppered throughout with gargoyles and other embellishments, is inherited from the Chondathan colonists who established Saerloon as their beachhead in this new land. Saerloon's citizens maintain a fever pitch of mercantile activity, seasoned by thievery and intrigue. In contrast to well-policed cities such as Daerlun, Saerloon is a happy plotting ground for thieves' guilds such as the Night Knives, slavers such as the Eyeless Mask, the Cult of the Dragon; the Red Wizards of Thay, and even the Dark Moon monks of Shar. Selgaunt (Metropolis, 76,714): Selgaunt is the richest and haughtiest of the Sembian cities. Its nominal ruler is a hereditary merchant mayor named the Hulorn. The merchants who actually rule Selgaunt indulge in greater than normal expenditures on intrigues and power politics, as if to prove that they can afford it. Between the current Hulorn, a secretive fellow named Andeth Ilchammar (N male human Nob4/Wiz3), and the Old Chauncel (as the old nobility in town likes to call itself), Selgaunt is the Sembian city least affected by the present power struggle within the extended family lo of the new Overmaster of Sembia. Urmiaspyr (Metropolis, 26,139): As Daerlun's link to the sea, Urmlaspyr maintains a steady buzz of merchant shipping. Its citizens are nearly as industrious as the people of Saerloon, without the steady diet of murderous intrigue, and nearly as friendly as the people of Daerlun, without the somewhat convoluted allegiances that plague that city's relations with its neighbors and relatives to the north. Urmlaspyr makes a point of open-mindedness, particularly where the divine powers are concerned. Hence the city is home to temples or shrines to deities such as Bane, Talos, and Umberlee - whose clerics would gladly raze the temples of Gond, Tymora, and Waukeen. Thaunn (Large City, 20,184): Yhaunn handles a great deal of the traffic between the Dalelands and the Sea of Fallen Stars. The city grew up on the site of an ancient quarry. The richest merchants live up high, on the slopes of the quarry. Poorer folk live farther down the slope, and so on, until the slums of the city ooze up against the well-policed section of the harbor that is reserved for commerce. The nation of Sembia began as a colony of distant Chondath, winning its independence when the Chondathans were crushed by the elves of Cormanthor at the Battle of Singing Arrows in 854 DR. For a time, conflicts with the elves threatened to destroy the new nation, but Rauthauvyr the Raven outmaneuvered the Elven Court, cutting a trade route through the great forest up to the Moonsea. Rauthauvyr instituted a form of government in which a merchant council elected an Overmaster to serve a seven-year term. The institution has been stable to this day, at least until the day before yesterday. In 1371 DR, Overmaster Elduth Yarmmaster died of old age. The new Overmaster is named Kendrick the Tall (LN male, human Rog4/Ftr7) of the great Selkirk trading family. Kendrick is generally regarded as a fair and honest man - but the same cannot be said of the rest of his family, whose plots and counterplots have sent the day-to-day affairs of Sembian politics lurching this way and that. Kendrick's family contains two other powerful individuals who appear to fancy themselves as future kings or queens, or at least as candidates for the next Overmaster. Miklos Selkirk, Kendrick's eldest son, spent the previous fifteen years as an adventurer in the Sea of Fallen Stars, the Moonsea, and the Underdark. As an adventurer, Miklos called himself the Silver Raven, a name that seems to have been calculated to enhance his future in Sembian politics, since Sembia's official arms consist of the raven (representing Rauthauvyr) and a stack of silver coins. Miklos makes the twenty-two-member merchant council of Ordulin extremely nervous, because he is not only a skillful negotiator and diplomat but a deadly warrior possessed of powerful magic gained during a career as a supposedly never-defeated adventurer. Kendrick's cousin, the Countess Mirabeta (LE female human Ari5/Rog4), appears to be Miklos's main rival for power within the family and within Sembia as a whole. Mirabeta acquired a leading interest in the Six Coffers Market trading house and established a strong relationship with the church of Waukeen. Mirabeta funded and supported the church in its early days of reestablishing itself in Sembia. These good works help conceal one widely known fact: Mirabeta is as evil as they come. Since she usually knows how to conceal her true intentions, she can safely be assumed to be sane, but that's one of the few good things that can be said about her. Her five children, and their children, are no better. Unwilling to completely let go of his adventuring days, Miklos has formed a personal army of one hundred to two hundred skilled and loyal Sembians to improve Sembia's image abroad, gather information, retrieve magical treasures, and accomplish the types of missions he took care of himself when he was an adventurer. Some of the Silver Ravens are adventurers of good heart, but others are evil rogues who know, a good deal when they can find it. Miklos sees his Silver Ravens as a potential counter to the Harpers, who have seldom been friends of Sembia. He would prefer that his agents conduct themselves honorably, and encourages true paladins to take up his colors, but he is realistic enough to know that some missions cannot be accomplished by honorable means. For the most part, Miklos prefers agents who see things as he does - true neutrals whose loyalty is to Sembia. Inside Sembia, Silver Ravens wear Miklos's coat of arms. Outside Sembia, Silver Ravens often go incognito, revealing their identities only when among friends. Sembia's merchant princes operate above the law. Competition can be fierce, and more than a few are willing to engage in whatever tactics are necessary to secure an advantage. The Beating of Silver Wings: Outside Sembia, as the PCs are preparing to accept payment for an upcoming mission in the pursuit of a higher cause, a squad of Silver Ravens appears and offers to perform the task for free. Naturally, the Ravens intend to keep any magic treasure they find, but their stipend from the Selkirk family treasury enables them to take on dangerous adventuring missions for free. If the PCs accept the mission anyway, the Ravens race them to the goal, a rivalry that could turn friendly or lethal depending on the PCs' personalities and relations with Sembia. Possession Equals Ownership: The PCs encounter a slave caravan or slave ship that is attempting to sneak into the northwest corner of Sembia. When the PCs defeat the slave drivers, they learn that the slaves were being taken to an estate owned by Mirabeta Selkirk's eldest son. Do the PCs attempt to turn their evidence over to Sembian authorities? Does Mirabeta's brood frame the PCs as slavers? Do Red Wizards perceive the PCs' difficulties and offer to take the whole lot of merchandise (slaves) off the PCs' hands in trade for magic? Sidebar: The Dark Side of Sembia.